Explore the hidden history at Varna Archaeological Museum. In the museum you can find 6000-year-old bangles, necklaces and earrings said to be the oldest worked gold found in the world. You'll also find Roman surgical implements, Hellenistic tombstones and touching oddments including a marble plaque listing, in Greek, the names of the city’s school graduates for AD 221. The inauguration of the Varna Archaeological Museum and its further development is closely connected with the names of the two brothers Herman and Karel Škorpil, Czechs by origin, who came to help with the education and culture of their sister Slavonic nation following the Liberation of Bulgaria from the Turkish Yoke. In 1894 they permanently settled in Varna. On 12 December 1901, a group of socially active figures and teachers established the Varna Archaeological Society that for decades since has been the basic motivating power for interest and study in the history of Varna, Varna Region, and Northeast Bulgaria. The inauguration of an archaeological museum was a task of prime importance for the Society. 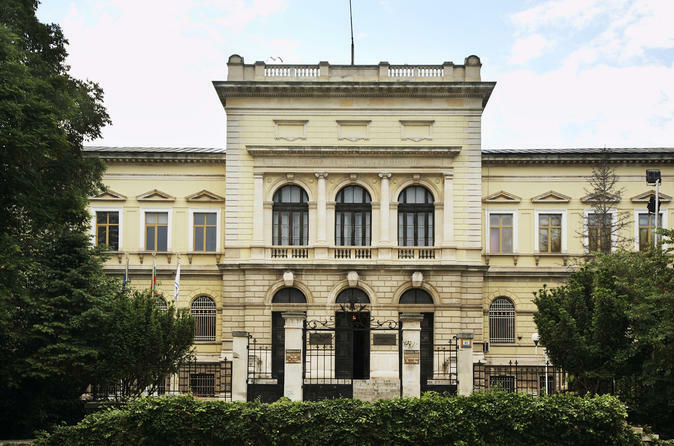 The building was originally constructed to be a Girls High School between 1892–1898 after the design of the famous Bulgarian architect Petko Momchilov. The architectural style is new renaissance. The building comprises of a basement area and two floors. It nearly forms a complete square and includes a spacious inner yard. Some of the rooms and the corridors are decorated with wall paintings. A continuous corridor runs throughout the whole building, leading to the exhibition rooms.